“A Native American farmer in Bucks County is about to lose his farm”. That telephone tip came my way three years ago this month. It concerned 145 acres known as theThorpe First Nation Family Farm. Currently owned by Dale and Renee Thorpe, the farm has been in the family for five generations and was in financial trouble with its mortgage holder. Much has happened since I got that phone call. In January of this year I posted a blog–Takin’ it to the court–highlighting the early struggles that brought together a hundred activists (including Native Americans) to save the Thorpe farm. 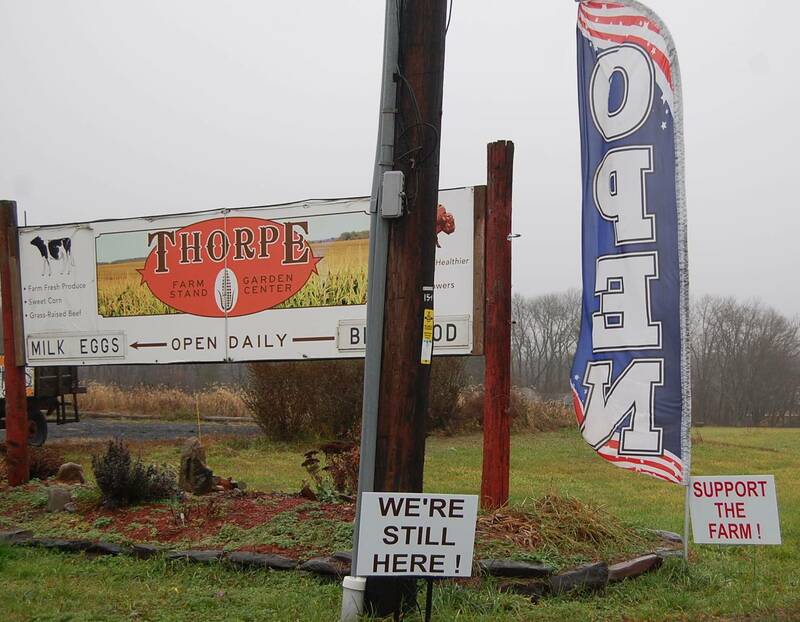 The Thorpe’s were determined to keep their farm. They petitioned Philadelphia Bankruptcy Court where they’ve appeared on and off over the last two years. At every turn the bank’s attorneys (Susquehanna, now BB&T Pavilion) fought them. Reluctantly, the Thorpe’s decided to sell off a separate parcel of 48 acres which would solve their mortgage problems. An interested prospect offered $1.2 million for the parcel and then strangely, withdrew the bid. This past summer the bankruptcy judge ruled that in order to satisfy the bank loan the entire farm must go up for auction. The auction was held on September 16. Bidding was swift. Surprisingly, for a paltry amount of $1.7 million the bank accepted a bid for the entire 145 acres which included the outbuildings, the family’s home and all the livestock. Equally surprising, the beneficiary of that bid was the same man who had previously offered to buy that 48 acre parcel at a slightly less amount but had changed his mind. Until a ruling is made on the auction bid, Dale, Renee and their five children remain on the farm. The appeal of the auction bid isn’t the only legal action they’ve taken to save their farm. On October 28, 2014 a Civil Rights lawsuit was filed in Philadelphia 3rd District Federal Court against Upper Makefield Township Supervisors. The suit lists multiple instances where the township had served unfounded zoning violations against the farm. Within the past two weeks the judge–Honorable Cynthia M. Rufe ruled the suit should go forward. Attorneys on both sides have begun discussions. There’s an ironic twist to this struggle that involves the Upper Makefield Supervisors. At the December 1, 2015 the Supervisors considered a proposal about a 30 acre farm threatened with sale. 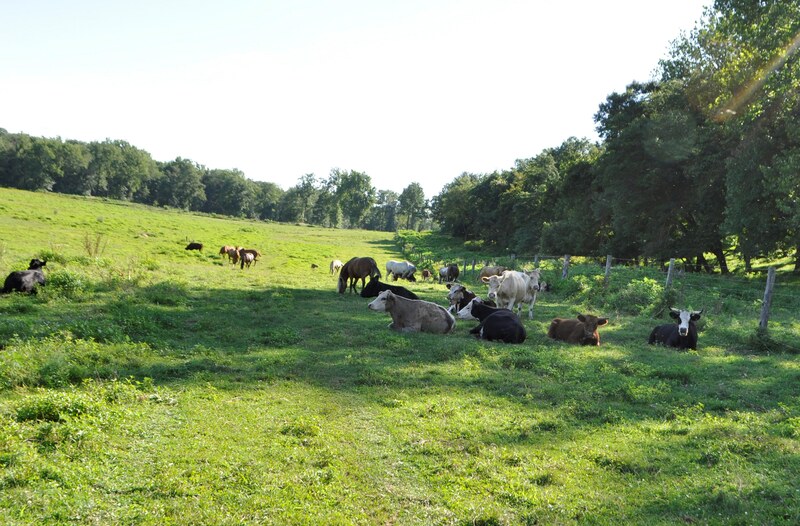 They voted to purchase 24 acres of the farm in order to establish a conservation easement. I am bewitched, bothered and bewildered to figure out where the township’s responsibility is in serving their constituents. Supporters for the Thorpe’s continue to stand with the family. The farm is sacred ground where once a tribe of the Lenape Nation lived, hunted, fished and are buried. The land has historical significance as it was the starting point for the William Penn Walking Purchase. Dale Thorpe is a distant relative to deceased Olympian Jim Thorpe. As a boy whenever he walked the farmland he would discover arrowheads in the soil. His tribal heritage includes Lenape, Sac and Fox Nations. The December 19, 2015 front page of Lancaster Farming published an in-depth interview with Dale Thorpe about the issues surrounding the financial and operational challenges facing the farm. The facebook page, Save Thorpe’s First Nation Organic Family Farm is the hub for updates to the cause. A supporter also created a gofundme page to raise money for the legal appeal of the auction bid (www.gofundme.com/festival of fears).